While generally the Manx cat is thought of a the "Tail-less" cat, in fact, a Manx can be born with a full tail, partial tail or no tail at all! While only the tail-less or partly tailed are usually accepted for show, all have the same loving and friendly personality and all make excellent pets. The CFA accepts the Manx in all colors and patterns except those derived from Siamese (color points). Eyes may be many colors, depending on the color and coat pattern of the cat. Manx cats can be shorthair and longhair. The coat length is the only difference between the two. The shorthair has a double coat, and the longhair has a silky texture to its coat. Brush the shorthaired Manx regularly and wash only if soiled. For the longhaired Manx, keep the coat combed with a metal comb and wash gently but thoroughly when needed. Always be certain to rinse your Manx thoroughly to be sure no soap residue remains in its thick, dense coat. 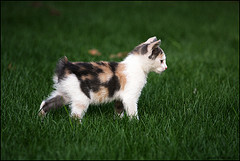 The Manx is an active and very playful cat. Excellent jumpers, it is not unusual to find them casually perched in the highest point of any room. They have muscular and powerful hind quarters and like to use them to stretch tall and climb as high as they can go. This cat will happily play games and fetch for his human, and enjoys being held and petted or gently groomed. The Manx is a medium sized cat. Stout in appearance and without looking obese, this breed has a broad chest and very powerful hind quarters ending in an extremely broad and round rump. Kittens can have a full tail, a short tail, a rise (rumpy riser), or no tail at all (rumpies), but only the rumpy or the rumpy riser are eligible for competition in the championship category at CFA shows. 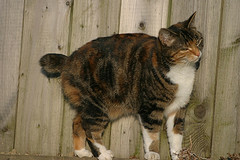 The Manx cat has a very round head and rounded cheeks. The back forms a continuous arch from shoulders to rump adding to the round appearance. The eyes are rounded too, but set at a slight tilt toward the ear. This unique cat is very family friendly and frisky. Don’t be fooled by the bunny-like appearance, for this cat is not a hopper, but a high jumper! The Manx has been popular for a long time due to not only its beauty but for its lively, entertaining antics. Curious and a little bit of a packrat, the Manx will often collect small objects. The Manx is a perfect choice for families who have other pets or children. This cat is happiest within its own family unit, a bit wary of strangers and appreciates a tall cat tree to retreat to and practice climbing on. Would you like to find out about Manx Cat Myths ? Have a look at my section on Cat Mythology too. There will be more and more good information as time goes by. I hope you will visit often and enjoy your time here.